BANGKOK: -- FOREIGNERS WHO do regular visa runs in order to extend their stay in Thailand have less than a month before a crackdown by the authorities to enforce immigration laws more strictly. Visa runs have been common among foreigners in Thailand recently, given that a simple search on the Net turns up several companies offering "visa trips" for expatriates staying or working here. "I have done visa runs several times before, because my employers would not agree to seek a work permit until I passed their probation period. So, when you stop allowing visa runs, the lives of many foreigners in Thailand will be affected," a 46-year-old American said. Meanwhile, the Immigration Bureau website says: "Leniency will be granted until August 12, but only for passengers arriving by air. Foreigners who come to Thailand must seek a proper visa in line with the purpose of their intended stay here." Now, those on a visa run who are allowed back in will find an "O-I" (Out-In) mark next to their latest stamp marking entry. From August 13, nobody with an O-I sign on their passport will be allowed to re-enter Thailand if they cannot produce a proper visa. 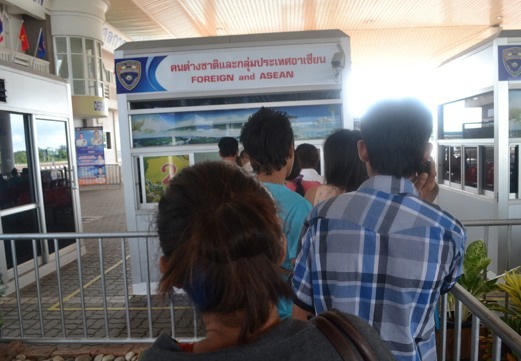 "They come here to work as tour guides, waiters, waitresses, etc," he said, pointing out that these visa-runners are often based in tourist centres such as Phuket and Songkhla. However, he said the presence of the so-called "out-in" migrants in the South had been significantly reduced because immigration officials were already enforcing stricter laws. "We have to be strict because we have to uphold laws and properly control immigrants. Efficiency on this front will also reduce crime," he said. Pol Colonel Thirachai Dedkhad, the superintendent at the Sa Kaew checkpoint, said officials under his supervision were not stopping visa runners from re-entering yet. "But we have been warning them to acquire a proper visa before they come to Thailand the next time." "We have made it clear that if they want to work in Thailand, they must seek a work permit and get the right type of visa," Thirachai said. Had this confirmed to me last night by Kap Choeng Immigration for the Chong Chom Border Crossing. was the out/in a visa exempt of a multiple entry visa? Looks like a lot of foreigners are either leaving or will have to get married, have a child or get a retirement visa. I'm on double entry tourist visa spending a week in Vietnam and arriving back to Thailand on 14th for second half of my visa. Wonder how this will go. I don't have any back to back visas in my passport, and I don't have any visa exemptions. I do have multiple double entry tourist visas over many years. Visa was acquired from home country, not a border country in Asia. What is the minimum amount of time a suspected visa-runner should stay out of the kingdom to avoid the dreaded O-I stamp? Will it be 24 hours, 48 hours, 72 hours, or is it going to be another arbitrary decision based on the whim of each border agent? Off-topic side note: This past week I have been inundated with requests to teach or tutor English. Requests are coming from all directions. I say no because I am not a qualified English teacher. Are a lot of undocumented English teachers packing up and leaving? How do you define Out/In though? I'll be in Vietnam for 7 days. Is Out/In about people who cross back the same day? 1 day? 3 days? 1 week? I wish the immigration rules were clearer. Nobody knows including the guy at immigration. youre 7 days and using an airline. dont worry. they are targeting the same day folks and the back to back visas. care to show ONE example where a double entry tourist visa has been refused after a 7 day trip out? A lot of people are going to lose a lot. Including Thais. This is baby with bath water on steroids. Too inflexible and done too fast. It would be OK if there were now easier "real" visas, work permits, including legalization of online freelancing, etc. But there is not. On the condo market, no kidding, this is really bad for places like Pattaya. Cause and effect clearly not well considered on this one.